Fr. 127. 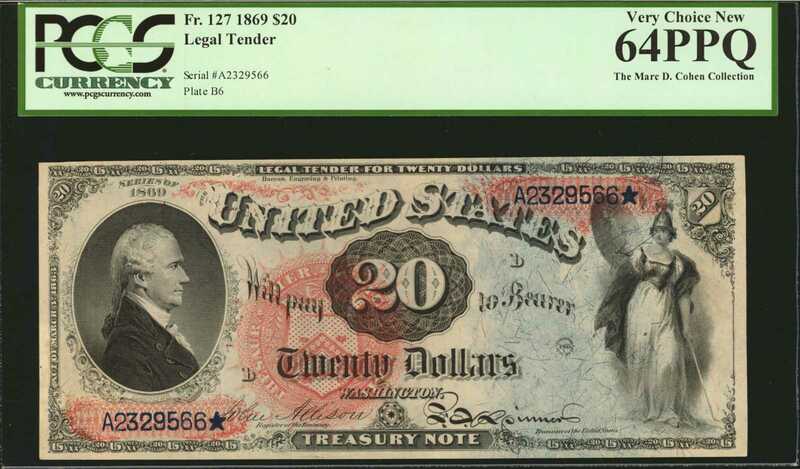 1869 $20 Legal Tender Note. PCGS Currency Very Choice New 64 PPQ.A highly scarce catalog number in any grade and from one of the most popular legal tender series. The note is from a known run of Uncirculated examples. The colors are striking with blue tinted paper contrasting nicely with the red seal, serial number protectors and floral over-printed design. Countless raised silk fibers can be seen through the holder. With Gem notes of this catalog number bringing close to $50,000, this attractive Choice Uncirculated 64PPQ will prove to be an attractive alternative. One of the most visually pleasing and the finest example we have ever offered.From the Marc D. Cohen Collection.